Video of making largest 3d street art which got Guinness World Record for the largest ever 3D street art. Today Reebok CrossFit, a revolutionary strength and conditioning programme, teamed up with artists 3D Joe and Max to break the Guinness World Record for the largest ever 3D street art. 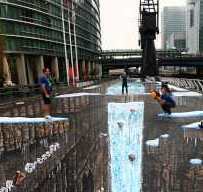 The painting measured an impressive 1160.4mÂ² and was unveiled at London's West India Quays, Canary Wharf. Here the public were invited to take part in a Reebok CrossFit WOD (workout of the day) on the spectacular artwork.